We live, we are so often told, in an information age. It is an era obsessed with space, time and speed, in which social media inculcates virtual lives that run parallel to our “real” lives and in which communications technologies collapse distances around the globe. Many of us struggle with the bombardment of information we receive and experience anxiety as a result of new media, which we feel threaten our relationships and “usual” modes of human interaction. Though the technologies may change, these fears actually have a very long history: more than a century ago our forebears had the same concerns. Literary, medical and cultural responses in the Victorian age to the perceived problems of stress and overwork anticipate many of the preoccupations of our own era to an extent that is perhaps surprising. The caption reads: “These two figures are not communicating with one another. 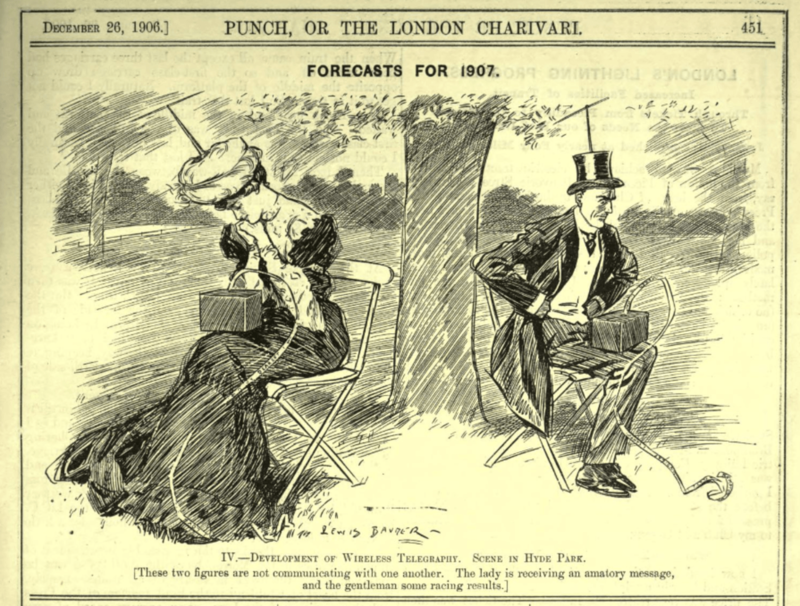 The lady receives an amatory message, and the gentleman some racing results.” The development of the “wireless telegraph” is portrayed as an overwhelmingly isolating technology. Replace these strange contraptions with smartphones, and we are reminded of numerous contemporary complaints regarding the stunted social and emotional development of young people, who no longer hang out in person, but in virtual environments, often at great physical distance. Different technology, same statement. And it’s underpinned by the same anxiety that “real” human interaction is increasingly under threat from technological innovations that we have, consciously or unconsciously, assimilated into daily life. By using such devices, so the popular paranoia would have it, we are somehow damaging ourselves. 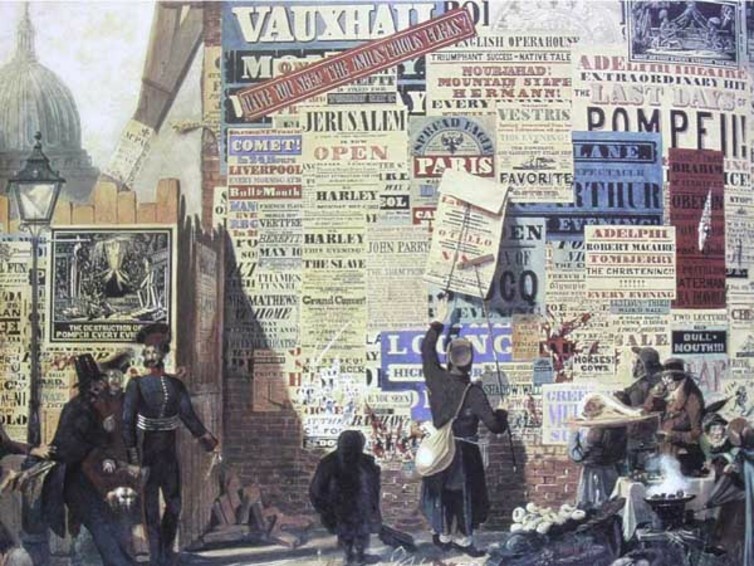 The 19th century witnessed the rapid expansion of the printing industry. New techniques and mass publishing formats gave rise to a far more pervasive periodical press, reaching a wider readership than ever before. Many celebrated the possibility of instant news and greater communication. But concerns were raised about the overwhelmed middle-class reader who, it was thought, lacked the discernment to judge the new mass of information critically, and so read everything in a superficial, erratic manner. The philosopher and essayist Thomas Carlyle, for example, lamented the new lack of direct contact with society and nature caused by the intervention of machinery in every aspect of life. Print publications were fast becoming the principal medium of public debate and influence, and they were shaping and, in Carlyle’s view, distorting human learning and communications. A state of society where any voice, not pitched in an exaggerated key, is lost in the hubbub. Success in so crowded a field depends not upon what a person is, but upon what he seems: mere marketable qualities become the object instead of substantial ones, and a man’s capital and labour are expended less in doing anything than in persuading other people that he has done it. Our own age has seen this evil brought to its consummation. Individual authors and writers were becoming disempowered, lost in a glutted marketplace of ideas, opinions, adverts and quacks. The parallels with the concerns of our own society are striking. Arguments along not at all dissimilar lines have been advanced against contemporary means of acquiring information, such as Twitter, Facebook, and our constant access to the internet in general. In his 2008 article, “Is Google Making Us Stupid?”, journalist Nicolas Carr speculated that “we may well be in the midst of a sea change in the way we read and think”. Reading online, he posits, discourages long and thoughtful immersion in texts in favour of a form of skipping, scanning and digressing via hyperlinks that will ultimately diminish our capacity for concentration and contemplation. Writers, too, have shared Carr’s anxieties. Philip Roth and Will Self, for example, have both prophesied these trends as contributing to the death of the novel, arguing that people are increasingly unused to and ill-equipped to engage with its characteristically long, linear form. Of course, all old technologies were once new. People were at one point genuinely concerned about things we take for granted as perfectly harmless now. In the later decades of the 19th century it was thought that the telephone would induce deafness and that sulphurous vapours were asphyxiating passengers on the London Underground. These then-new advancements were replacing older still technologies that had themselves occasioned similar anxieties on their introduction. Plato, as his oral culture began to transition to a literary one, was gravely worried that writing itself would erode the memory. While we cannot draw too strict a line of comparison between 19th-century attitudes to such technologies as the telegraph, train, telephone, and newspaper and our own responses as a culture to the advent of the internet and the mobile phone, there are parallels that almost argue against the Luddite position. As dramatically as technology changes, we, at least in the way we regard it, remain surprisingly unchanged. The Victorians’ fascination with objects and things has proved equally fascinating to the field of Victorian Studies. In keeping with this ‘material turn’, the last decade has seen an upsurge in interdisciplinary, collections-based research that enriches our understanding of Victorian Literature while expounding upon the diverse material culture of the period. This workshop is a means of learning more about the nature and methodologies of current object-led research in Victorian Studies, as well as the broader issues surrounding this kind of research such as using online resources, locating materials, and searching collections. Bringing together researchers and curators who work across the nineteenth century, we will be asking questions about how to ‘read’ objects, how to situate such materials within a broader historical context, and how to construct narratives based on object-based research. Please register via this link. The workshop will take place in the Woburn Room, Senate House Library, Malet Street, London WC1E 7HU. For a map and travel information, please click here. In 1873, a speaker at the Royal Dublin Society declared that ‘many persons are inclined to deny altogether the existence of a weather-science; the triteness of the subject, viewed as a break-ice topic of every-day conversation, having … tended to conceal from them the scientific aspect of the study of weather and climate’. Here, the speaker alluded to the weather as an ever-present but under-investigated topic. Interest in the weather had a long history – the keeping of weather journals was a popular pursuit in the eighteenth century, and from 1751 the Gentleman’s Magazine published a monthly weather report within its pages. The nineteenth century, though, saw more concerted efforts to chart the weather. As travel increased, the impact of the weather on both leisure and trade became an important factor, and monitoring conditions across the globe became easier with technologies such as telegraphy. Observatories collecting meteorological data including rainfall, wind direction, and temperature were set up at Greenwich and Kew in the 1840s, and the precursor of the Met Office established in the 1850s. Alongside these government-level endeavours was an army of amateur observers, organised and advised by the Meteorological Society. Alongside intricate measurements using a variety of instruments, there was also some appeal to ‘natural’ weather indicators, particularly in almanacs and gardener’s diaries. An unusual suggestion for a ‘natural barometer’ was offered in 1897’s The History of the Weather, which claimed that blackcurrant lozenges imbibed moisture and could ‘predict’ rain. There were also said to be ‘human barometers’. Oft recounted was the case of Captain Catlin, who was apparently able to foretell rain by the pain experienced at the site of his leg amputation. The effect of weather on the body had long been recognised. The impulse to quantification exhibited by nineteenth-century observers, though, opened up the possibility of charting such effects more carefully. From 1838, the General Register Office collected weather information alongside mortality statistics, and renewed impetus was given to such studies following mid-century cholera epidemics. Some doctors began to argue for the necessity of a national network of medical observers of the weather. In this way, harmful atmospheric influences might be recognised and eradicated, or artificial environments constructed for ailing patients. Temperature and mortality of London, 1840-50, from William Farr, Report on the mortality of cholera in England, 1848-49 (1852). Wellcome Library, London. Several doctors saw the value in such an enterprise, and some were already volunteering observations to the Meteorological Society, particularly if they had a large site available to set up meteorological equipment. Hospitals or asylums often possessed open grounds where phenomena such as wind speed could be measured. A Meteorological Society inspector, checking the station set up on the Superintendent’s lawn at Caterham Asylum, was not impressed with what he saw in the 1870s, though: ‘I inspected Dr Adam’s instruments … [and] they were almost all bad’. Dr Adam was given a ticking off and a set of new, Society-approved, instruments for his observations. Summer calm and winter storms. Lithograph after A.M. Perrot. Wellcome Library, London. Crallan’s concern for determining a ‘cycle’ of mental distress fitted – as Niall McCrae observes in The Moon and Madness – with the late nineteenth-century reconfiguration of mania and melancholia as one cyclical illness, rather than two separate ones. Though he was undertaking his investigations in a self-consciously ‘scientific’ way, Crallan also appeared to be imagining the asylum patient as a kind of ‘natural barometer’. In the eighteenth century, an awareness of approaching weather tended to be seen as a marker of sensibility, with one’s affinity with the environment a sign of sensitivity. During the nineteenth century, a good deal of attention was paid to the ‘natural barometers’ of the animal kingdom, which tended to be the lower animals – frogs and insects. This is rather wonderfully illustrated by the ‘Tempest Prognosticator’ of George Merryweather, which predicted storms based on the movement of leeches. In imagining the asylum patient as a kind of human barometer, keen to atmospheric changes, doctors were (consciously or unconsciously) aligning them with the animals of weather folklore – a link that fitted into wider discourses about insanity, degeneration and ‘de-evolution’. Merryweather’s Tempest Prognosticator. When agitated, the leeches attempted to climb out of the jars and triggered a bell. What became of medical meteorology, then? The attempts of bodies such as the Association Medical Journal to institute a nationwide network of medical observers proved difficult, as doctors disagreed over the specifics of how to record illness in tabular form. Nevertheless, attempts to correlate weather and mental distress continue to appear sporadically – several researchers have linked suicide and the advent of spring, for example, while moon lore continues to circulate amongst hospital emergency departments, with trepidation before a full moon and an anticipated influx of patients. Our Royal Dublin Society speaker would no doubt be pleased by this continued research into the weather’s effects, even if it does also remain the stereotypical ‘break-ice topic of every-day conversation’. Katharine Anderson, Predicting the Weather:Victorians and the Science of Meteorology (2005). James Rodger Fleming, Meteorology in America, 1800-1870 (1999). Niall McCrae, The Moon and Madness (2011). J.W. Moore, Royal Dublin Society. Afternoon Scientific Lectures on Public Health, 1873. Lecture III. Meteorology in its bearing on health and disease (1873). R.E. Scoresby-Jackson, On the Influence of Weather upon Disease and Mortality (1863).